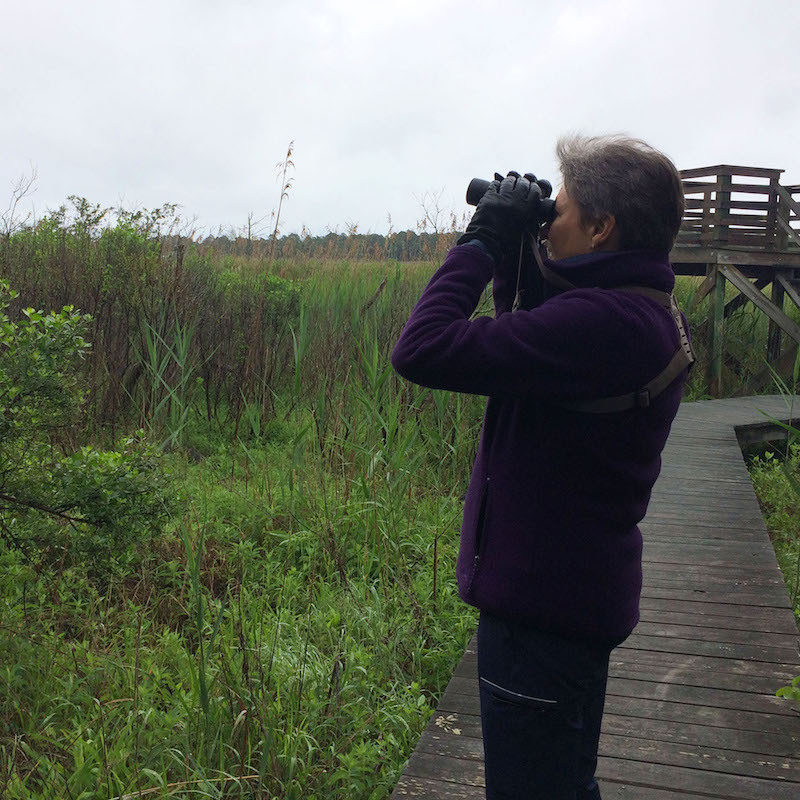 On a cool, drizzly, late May morning, my colleague Katie Goerger and I set out from the parking area at the James Farm Ecological Preserve, binoculars in hand. Our mission – to complete an eBird checklist for the Farm. Marginal weather, combined with insufficient coffee, meant we got started on our walk a bit later than hoped, so we missed much of the “dawn chorus”. Nevertheless, in an hour and a half we saw or heard a total of 47 species of birds, including a wild turkey spotted by CIB Program Manager, Bob Collins, on the green trail. The James Farm is a featured site on the official Delaware Birding Trail and is a fantastic place to spot birds, year-round! With trails traversing many different types of habitat, including forests, meadows, wetlands, and beaches, the preserve attracts a wide array of birds and other wildlife. 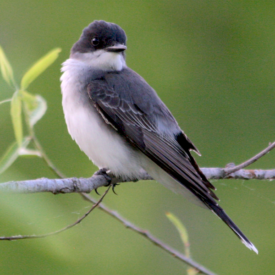 Although much of the spring songbird migration is over, breeding activity for resident species is now well underway! While we were out, many male birds sang through the morning hours, including a lustful Swainson’s Thrush who projected his spiraling, flutelike song from the brushy understory along the red trail. We saw plenty of songbird parents carrying caterpillars to their nests or defending their territories. Ospreys flew by with fish for their young. Pairs of kingbirds danced over the salt marshes, chattering to one another as they captured flying insects. 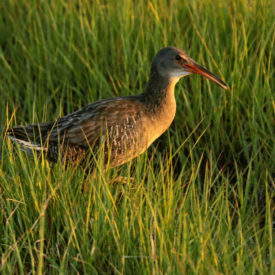 Clapper Rails grunted in the cordgrass. There is nothing like being in Nature, completely aware of, and connected with, the multitude of life around us. I recall a phrase I once read about nature observation: “In the stillness, miracles occur.” Absolutely true. To bird is to be fully present. The mind must be quiet in order to hear and see with full attention. All the senses are engaged. When Katie and I returned from our bird walk, I submitted our morning’s observations to the eBird website, an online birding checklist tool maintained by the Cornell Laboratory of Ornithology and the National Audubon Society. 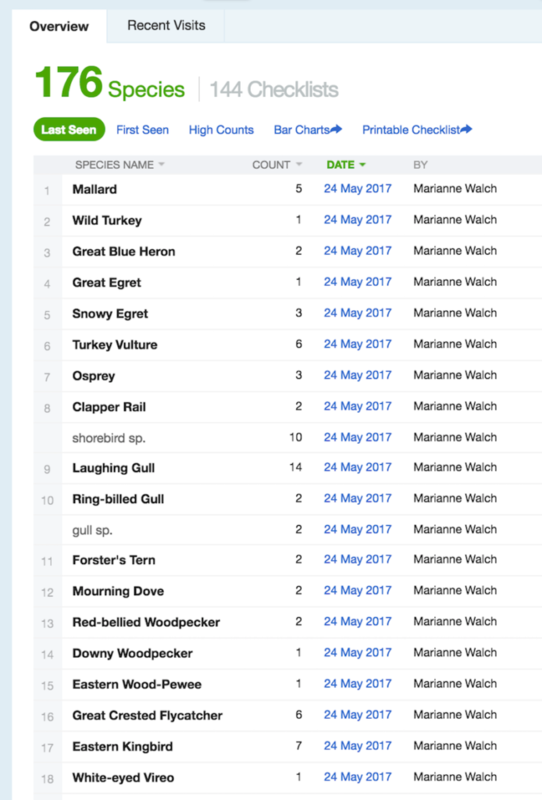 Birders from around the world report their observations through this website, and eBird has quickly become one of the largest and fastest growing repositories of biodiversity data. Anyone can submit, view, or download data and many scientists use it in research such as examining climate change impacts on migration patterns. It is citizen science at its best! The James Farm Ecological Preserve is listed as an eBird ‘hotspot’ – with 144 checklists submitted to date; That’s a total of 176 bird species reported! We encourage everyone who birds at our James Farm Preserve to help us out and enter their checklists on eBird. The Farm is being managed to increase biodiversity, and data collected through eBird is an important tool used to monitor the success of our efforts. One of those 144 checklists is the one I just submitted – go take a look at it and then click around the page to see when various species of birds have been observed, find out if there are any rare species hanging around, or print a checklist to take out with you into the field! 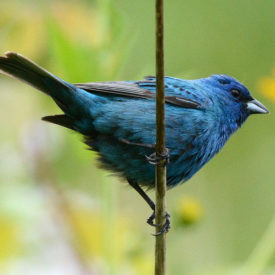 We are blessed to live in a watershed that contains such an abundance of great birding and other outdoor activities. And James Farm is a gem right here in our back yard. So grab your binoculars, and go for a walk, and let us know what you see! 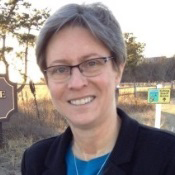 Dr. Marianne Walch is the CIB’s Estuary Science and Restoration Coordinator. In this position she leads the Center’s research, monitoring, and aquatic ecosystem restoration efforts. Marianne brings 30 years of environmental research experience in academic, federal and state government positions to the Center. This entry was posted in Staff Blog and tagged birding, birds, citizen science, ebird, james farm, james farm ecological preserve. Bookmark the permalink.